Have you ever wondered what qualifies a person to be attractive? In our society, there are various celebrities that a majority of people regard as attractive. We even see this on a more down-to-earth scale among our peers. There is always that one girl, or boy that you and your group of friends can undoubtedly label as attractive. Shockingly enough, there is a science behind what makes someone attractive. This is explained by facial symmetry. Many believe that attractiveness relies on the proportional size of one’s facial features. The truth is that humans are attracted to facial symmetry . This means the more symmetric the left, and right sides of one’s face is the more likely they are to attract others. Mirror images of both sides can be generated to compare their similarities. To prove this theory a study was carried out involving toddlers. A computer system generated images of faces. Both “unattractive”, or non-symmetric, and “attractive”, or symmetric, faces were created. It was found that the toddlers tended to allot more time staring at the “attractive” faces, rather than the non-symmetric ones. These results lead researchers to believe there is some correlation between attractiveness and symmetry, as toddlers served as unbiased participants. In terms of finding a partner, there are other qualities to be considered in addition to just facial symmetry. Psychologist note that there five laws of attraction. Number one, is physical attraction, which can be attributed to symmetry. Number two is emotional connection. This means that you are more likely to be attracted to someone with whom you can connect with on a deeper level that exceeds just what you are attracted to one the exterior. Number three is proximity, which merely means you are more attracted to individuals you are likely to come in contact with. Number four, a consequence of proximity, is familiarity. This means the more familiar you become with a person, the deeper your attraction will grow. Lastly, number five is similarity. This one is fairly obvious, as we are going to naturally gravitate those who share similar attitudes, aspirations, and motivations as ourselves. As you can see there are many factors that contribute to the perceived attractiveness of a person. In all of my findings, the best piece of advice I have discovered was to simply be yourself! Personally I feel as though, authenticity is the most attractive trait someone can possess. This entry was posted in Uncategorized on October 21, 2016 by Darby Marie Showers. In our generation, it seems that everyone is doing away with non-organic products, and leaning in favor of the seemingly healthier organic options. The USDA has found the prices of organic products to be about fifty percent more expensive than their non-organic counterparts.Though the prices of these organic prices are noticeably higher, are the health benefits of opting in favor of such products significant enough to pay them? In wake of the debate over which is better, organic or non-organic, researchers have put a lot of time in uncovering the truth. Three studies carried out in 2009, 2012, and 2014 all found that the difference in nutritional value was extremely insignificant. The only slight difference between organic and in-organic products, was that phosphorous levels were recorded to be higher in organic products. Consumers, who are aware that organic products contain little to no increased nutritional value, may still opt to purchase them. Why, you may ask? These consumers argue that non-organic products are sprayed with harmful pesticides, while organic ones are not. If only this argument could be justified, but sadly it is just a myth as well. Though organic products are thought to be grown in a more natural way, their growth process still requires the use of pesticides. These are referred to a “organic pesticides”. A study has found that these pesticides are actually needed in larger doses in comparison to the quantity needed to non-organic products. As a consequence they prove to be irreversibly, detrimental to the environment. These findings have definitely made me think twice before I purchase organic goods in the supermarket, and I hope they urge you to rethink your choices as well! Have you ever recalled an event, or the title of something, and swore it was correct only to discover your memory failed you? Have you ever heard of this happening to a large group of people? As unlikely as it seems for a large group’s consensus to be incorrect, it happens more often than you would think. This fallacy in human remembrance is regarded as the Mandela Effect. So you may be wondering when was this theory developed? It was in 2010 that Fiona Bloom, a prominent blogger, realized that she, along with many others, incorrectly remembered the death of Nelson Mandela. She whole-heartedly believed Mandela died while being detained, even recalling news coverage about his passing. Others remembered the event exactly as Bloom did, the only issue was that at the time of this discovery, Nelson Mandela was alive, and well. After this discovery was made, many people came forward protesting that this lapse in memory proves that there is a “parallel universe” somewhere out there. While it is an interesting possibility to ponder there are several other explanations for why this occurs. The misinformation effect could be a possible explanation, as it occurs when one incorrectly recalls personal memories. Confabulation is also involved in most reports of the Mandela Effect, as it is literally the falsification of a memory. I believe that the Mandela Effect is highly linked to false memories. False memories are a phenomenon that describes when an individuals have remembrances of events that never occurred. This usually occurs after a trauma has been suffered, acting as a mental defense mechanism. Though there its no solid scientific explanation for the Mandela effect, I do believe there is a link between it and science. I hope that with further research that link can be discovered. Here is a link for some common examples of the Mandela Effect, enjoy! This entry was posted in Uncategorized on October 20, 2016 by Darby Marie Showers. All my life a participated in sports. I went all through grade school, and high school with an athletic activity following my school day. A lot of girls I participated on teams with, would always complain that being in a sport caused them to stress about school. I never once have felt that way. I always thought that I did better in school because I did a sport. It helped keep my schedule consistent, and I was always more mindful of my time-management. This caused me to wonder if there was any link between participating in sports, and performing better academically. Researchers from the University of South Carolina and The Pennsylvania State University, have deciphered data derived from over nine thousand students in the fourteen to eighteen age range. These students were from a wide range of geographical, and socioeconomic backgrounds, and they participated in various types of after school activities. These activities included sports, arts, and academic clubs. Of these activities it was found that participating in a team sport seemed to be the only activity that held steady results across the board. Professor Matthew Irvin headed this research, and was pleased with the findings. His explanation basically entails that sports allow one to boost their set-confidence, which radiates into other aspects of their life, in this instance school. Being on a team, one is exposed to positive role models, social interaction with teammates, constructive criticisms, and most importantly physical activity. All of these elements prove to motivate one to strive, achieve in their academics. Another explanation for this comes from The Society of Neuroscience. Through their research, they have found that when one subjects themselves to physical activity they subsequently up the number of brain cells in the hippocampus. The hippocampus serves many purposes, one of which is being the memory center of the brain. That being said, the hippocampus is pertinent to one’s ability to learn, and thrive in an academic setting. They also uncovered that being exposed to social instances has a similar effect on the number of one’s brain cells as well. These findings collaborate that participating in sports is beneficial to students, as athletic activities offer both physical, and social benefits. Is listening to music while studying detrimental? If you have ever walked in to a college library, it is unlikely that you will see a student without headphones on. Many students opt to listen to music while they are doing schoolwork, or studying. I personally do this myself, as I never have worked well in dead silence. Noting that such an abundance of my peers do the same, I wondered if listening to music while studying actually promotes our performance in school, or if it just served as a distraction. To research this question, I have focused on a study conducted at the University of Wales. Participants were given a simple recall test, and were to repeat the test in five different environments. The first environment was a quiet one. The second was one in which a numerical number was consistently repeated over, and over. This was regarded as the “steady” environment. The third environment was similar to the second, but instead of one number being steadily repeated, a variety of numbers were repeated instead. In the fourth environment, participants listened to music they liked, and in the fifth they listened to music that they disliked. Personally, I was very surprised by the results of this experiments. I thought that those listening to the music they liked would preform the best, and the opposite was found. Performances were similar in environments four, and five. They proved to be extremely higher in environments one, and two which were the silent, and “consistent”. Another article further explains what may have caused these results. Listening to music while studying, may stimulate other regions of one’s brain. This may cause “interference” between parts of the brain that are trying to retain the information one is studying. This occurrence is more likely to happen while studying subjects that involve reading, and writing. This multi-tasking often leads to be detrimental to one’s study attempts. After looking over these results, I feel as though I will not be changing my study habits anytime soon. I personally have not noticed that music greatly effects the quality of my work, but instead motivates me to get it done. I think it is a personal preference to listen to music while studying, and I think it is a choice many college students will continue to favor. Does Exercise Make Us Happier? All throughout high school, I was very active. I always played sports, and made it a point to go to the gym. Now that I am in college, I cannot say that my healthy habits followed me here. It is difficult to fit the gym in, as I am still adjusting to my new schedule. I was telling my mom that I have not been working out as much as I use to, and she went off on a lecture about how working out will help elevate my mood. Taking her concern into consideration, I did remember that I was a lot less stressed in high school, ultimately contributing to me usually being in a great mood. As I thought about this, I wondered if it was due to my lack of exercise, or was it just because college was more difficult than high school? The Anxiety and Depression Association of America notes that exercise has quite an effect on various aspects of our lives. In addition to reducing stress, exercise has been shown to minimize fatigue, strengthen alertness, and boast overall cognitive function for those who engage in it regularly. The ADAA conducted a poll in order to find out just how many people engage in physical activity to reduce stress, or boost mood. They found that fourteen percent of people turn to exercise to deal with stress, and others turn to alternate activities such as watching TV, or sleeping. In addition, the ADAA sought to find what type of physical activity regular exercisers engaged in. The most popular forms of exercises were running, and walking. I believe this may be because they are the two most accessible forms of physical activity. So why does exercise have this calming effect on our bodies? When one subjects them self to physical exercise, the body releases natural endorphins, which are our bodies’ natural form of pain relievers. They are the cause of the surge of energy one feels after exercising, for example, a “runner’s high”. Endorphins are not only released after exercise, they can also be released after participating in alternate activities, such as laughing, or receiving acupuncture. After discovering this article, it is clear that there are many ways to eliminate stress as a college student. To me I definitely think exercise is the best option. It has physical benefits, as well as mental benefits that would greatly effect me as a college student trying to adjust to this new way of life. I now see how important it is to get back into my old habit of working out on a daily basis! This entry was posted in Uncategorized on September 15, 2016 by Darby Marie Showers. The Freshmen 15: Fact or Fiction? Entering college begins a new chapter in a teenager’s life. It is possibly the first time that they are truly on their own, without the supervision of their parents, or guardians. With all this newfound freedom, it is hard to remember responsibilities, including physical health. So, I was not surprised of the many warnings I received about the infamous “Freshmen Fifteen”. As people told be horror stories about college students gaining unthinkable amounts of weight by Thanksgiving, I though how true can this really be? Researchers from Ohio State, wondered the same thing, and conducted a nationwide survey. The survey was composed of questions inquiring about the yearly weight gain of college students. Around seven thousand college students’ responses were recorded. The outcome of the survey came as a shock to Jay Zagorsky, and his team at Ohio State, who thought for sure that they would find extreme weight gain over the course of the average student’s college career, more specifically in their freshmen years. Instead they found quite different results. It was discovered that, on average, women gain about three pounds their freshmen years,and men gained around three and a half. Over four years, it was found that students rarely gain close to fifteen pounds. The most surprising evidence found by Zagorsky was that only about ten percent of students will actually gain fifteen pounds or more, while twenty five percent of students actually lose weight their freshmen year. They also found that excessive drinking only effected students’ weight gain by about an additional pound. As a freshmen in college, I can honestly say I was a little freaked out about the freshmen fifteen coming into school. With insane rumors flying around about people gaining weight, it’s hard not to be, but once school started my outlook change. I think the freshmen fifteen certainly is possible when you’re eating grease saturated foods, drinking every night of the week, and consuming mindless calories. It easy to push healthy eating aside when unhealthy options are extremely accessible. On the other hand though, it is totally avoidable by eating healthy, being mindful of what, and when you are eating, and by getting in some sort of physical activity daily. I feel as though it is important to stop referring to the “freshmen fifteen” as a definitive element of one’s freshmen year, because statistic imply that it very well does not have to be. This entry was posted in Uncategorized on September 14, 2016 by Darby Marie Showers. Deciding to join Greek life on campus was a conscious decision I made myself, in an effort to make Penn State’s massive campus a little smaller. Little did I know the last two weeks would be more stressful than I could ever imagine. I spent almost every second of my free time worrying about being accepted into a sorority that I belonged in. Throughout the process, many girls cried, agonizing over sororities that dropped them, but why? We all ended up where we belonged in the end. Do not get me wrong, I enjoyed it very much, and was very happy with the end result as I am now a part of a sorority that I love, but the entire time I was thinking why do we feel the need to fit in? Everyone obviously wants to make friends, and feel accepted by their peers. Some even go to extreme lengths to do so. Although these people, who seek acceptance, may believe they are their own person, it has been researched that often times individuals conform to the beliefs of those by whom they wish to be accepted by. Conformity is basically our natural instinct to relate to others by adopting their interest, opinions, and behaviors. This need to fit in was extremely prevalent among my high school peers, as I’m sure it is among almost all teenagers. Psychologist have been exploring this phenomenon for years. More recently, Lisa Knoll with her colleagues at the Institute of Cognitive Neuroscience conducted a conformity experiment. They basically were researching to see the extent to which teenagers are influenced by their peers, and adults. Volunteers were selected with ages ranging from eight years old to those in their fifties. All were asked to rate seemingly risky situations, and then they were revealed the ratings of the other volunteers. After they were shown the other ratings, it was noted that teenagers adjusted their initial ratings to be in accordance to their other teenage peers, but not the adults. The younger participants were more influenced by the adults. This experiment shows that teenagers do tend to comply with their peers. As the experiment somewhat mimicked the extent of the influence peer pressure has on teens, serving as a reminder the importance of staying true to yourself. This entry was posted in Uncategorized on September 13, 2016 by Darby Marie Showers. Hi guys! My name is Darby Showers, and I am from South Philly, though I now live in the Northeast. I am currently enrolled in the College of Communications, as I hope to pursue a degree in Advertising and Public Relations. 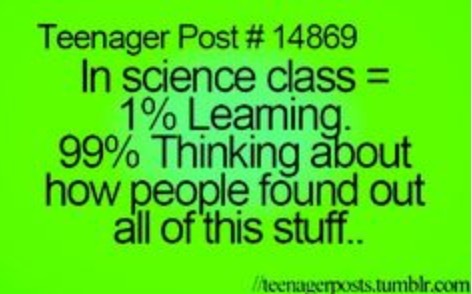 Ever since I started grade school I hated science. I wasn’t the type of kid that hated science because I consistently did bad in the subject, or that found the subject to be boring. Personally, I think science is so interesting, it is all around us, how could it not be? What I do find boring is the the repetitive science topics that teachers present to us from the time we are in elementary school, until we graduate high school. There are things that are presented to us over, and over again retaught in equally monotone manners. This monotone way of teaching always made me wonder if the information I was receiving in class was actually factual, and if it was how could it be proved. 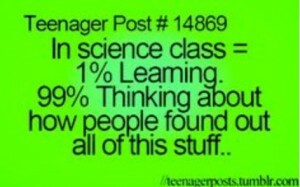 Science classes for me never required much thought from me as a student, it only required my memorization. I would go to class, copy notes, and formulas exactly as they came out of the teachers mouth, and when test time came I would simply recopy these “facts” that were presented to me in class. I never felt as though I was actually learning. I for sure can rattle off some facts, and recite a formula, or two, but I do not actually understand the material. So, when I was at NSO scheduling my classes, I told my advisor that I would like to avoid a science classes at all cost. Eventually when the time came for me to chose my General Education course, my advisor suggested this class to me. She assured me it was an interesting class that explored theories not presented in the typical science class. At first, I am not going to lie, the name “Science in Our World” turned me off, but after reading the course description I was instantly intrigued, and decided to enroll. Although we have only had a few class meetings, I already do not regret my choice, as I can already tell this will be a thought provoking course, and I am so excited to see what is in store for the rest of the semester! This entry was posted in Uncategorized on August 31, 2016 by Darby Marie Showers.